This page will focus on solution for system partition extending on Windows Server 2008 VMware when there is no available space. Download IM-Magic Partition Resizer Server to extend system partition space when it needs free space on Windows 2008 VMware. Many people have trouble in extending system partition because it requires you reinstall system and repartition the hard disk. Now, it is quite easy to extend system partition without reinstalling system or repartitioning hard disk. You just need to rely on third-party partition software to perform partition resizing. IM-Magic Partition Resizer Server enables you to extend system partition or data partition on Windows Server 2008 VMware and other Windows Servers. This partition software is a professional partition tool for Windows Servers, with which you can not only extend partition but also shrink and move partition. You can move the unallocated space close to system partition by drag the mouse. Then, right click the system partition and choose "Resize/Move" option. "I installed a VMware machine on my PC that runs Windows Server 2008 operating system. There are two partitions (C drive and D drive) on the VMware machine, and now the C drive (work as system partition) only has little free space. So I want to expand the size of C drive. Can you tell me how to extend C drive on Windows Server 2008 VMware?" "Hello! System partition is running out of disk space on Windows Server 2008 in VMware. I don't want to reinstall VMware machine or reinstall system to fix the problem. 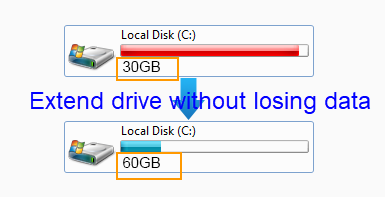 What I want to do is to look for a way to increase the size of system partition with an easy method. For example, I would like to move some free space from another partition to extend the system partition. I remember that Windows 2008 Disk Management has such a function, but I don't know how to do it. Can anyone give me a hand?" It used to be difficult to extend system partition, but now it is easy as it could be if you can use professional partition software. Traditionally, you may need to reinstall system and reformat disk in order to extend system partition. Now, things could be much easier with help of IM-Magic Partition Resizer Server. This partition software can resize system partition without reinstalling system or affecting the performance of the Server. You just need to drag the mouse and move arrows so as to extend system partition without even rebooting the computer. You can get system partition expanded with simple three steps as below. Before extending system partition, you should ensure that there is unallocated space on the same hard disk. If there is no existing unallocated space, the IM-Magic Partition Resizer Server can help shrink the partition that has free space to produce some unallocated space. After producing unallocated space, you still need to move it close to system partition. It is an easy task to move the unallocated space close to system partition by using the professional partition software. Finally, you can add the unallocated space to extend system partition without rebooting computer or touching any data on the disk. 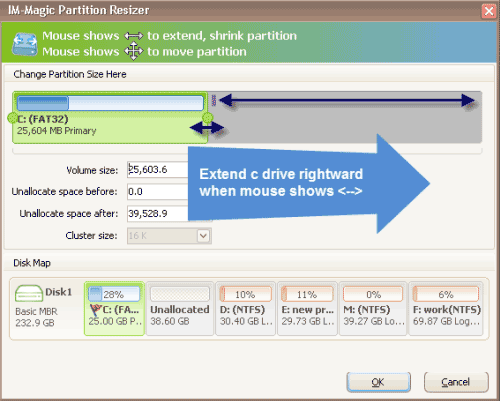 Anyway, IM-Magic Partition Resizer has the function of resizing system partition on Windows 2008 VMware, SBS 2008, Windows Server 2008 R2 and more. The partition software can not only support basic hard disk, but also it support to resize RAID 5 system partition. IM-Magic Partition Resizer Server is available for VMware extend C drive Windows 2003, 2008, 2012, SBS 2003, 2008, Windows Server 2003 R2, 2008 R2, 2012 R2 and all Windows Servers. It is true that you can extend system partition or data partition under Disk Management on Windows Server 2008. After right clicking a partition, you can see that there are two options ("Extend Volume" and "Shrink Volume"). When there is adjacent unallocated space beside the partition you want to extend, you can select "Extend Volume" option after right clicking this partition. Otherwise, the "Extend Volume" option will be grayed out. Another disk manage tool on Windows 2008 is Diskpart command, but it only allows you to extend data partition which is NTFS file system. Diskpart command is not available for system partition resizing.